Completely software-driven, true 100% digital motion detection completely converts, amplifies and processes the sensor's low-level signal in the digital domain without any analog circuitry. The sensor's entire signal is processed without any saturation or noise, which provides increased accuracy, reliability and superior false alarm immunity. Movement generates a unique sequence of signals. For each signal, Shield measures and calculates the signal's parameters (amplitude, duration, peak level, polarity, rise time and shape) in real time and then stores them in memory. 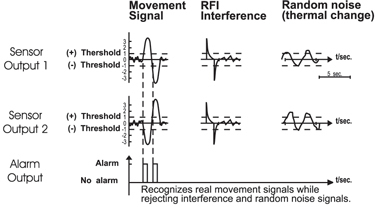 Each signal is compared with a reference bank of movement and non-movement signals. If the signal does not meet movement criteria, it is immediately rejected. Auto Pulse Signal Processing (APSP) measures energy from each detected signal and stores it in memory. To generate an alarm, the memory must reach a required minimum level. Thus, in the presence of high-level signals (very low risk of false alarms) the detector immediately generates an alarm, functioning as a "non-pulse count" detector, while low level signals (presenting a high risk of false alarms) will cause the detector to automatically switch to a very high pulse count mode - resulting in excellent protection against false alarms. Pulse counting rate depends on signal energy levels and can go much higher for RFI signals. ATC automatically adjusts the motion detector's sensitivity according to the difference between the room temperature and body temperature. This helps maintain the same operation in its operational temperature range without any loss of coverage or decrease in false alarm rejection. The Interlock Sensor Geometry's (ISG) interlaced pattern provides greater coverage over longer distances more effectively than conventional sensors. Standard quad detectors lose effectiveness as they reach their maximum coverage since a human body will not cross both detector beams at the same time. Compares the entry and exit signals' polarity. Only movement signals will generate opposed polarity signals, which will be processed by the software. Any interference signals will generate same polarity signals, which will be rejected by the software providing unmatched RFI and EMI immunity.